Had a thought-provoking article from David Evans last week. Can anyone help? The guys behind Staffshomeguard.co.uk would love to identify these sharpshooters. Comment here, or click on the image to visit their excellent site. The blessing of a chat over a cup of tea with a good friend, perhaps? In particular, the article written by Lieutenant W. Oakley, The Ground We Defend, which refers to Walsall Wood Home Guard. Amazingly he gives some of the names of the 32nd battalions detachment in Walsall Wood; Arblaster, Mycock, Smith. Mr George Mycock was the president of Walsall Wood Football Club, ‘The Prims’ at the time, I believe. Mr Smith, officer in charge, was the local chemist whose shop was in Walsall Wood High Street, now the Spar and Post Office. Mention is made in the article of training at two strong points, Castle Fort and Knaves Castle, which should be of interest to locals here and in Stonnall History Group, perhaps. There is also mention of Tom King the highwayman from long ago, and a certain Hostelry used by that gentleman, and also frequented by the local Home Guard during the war! 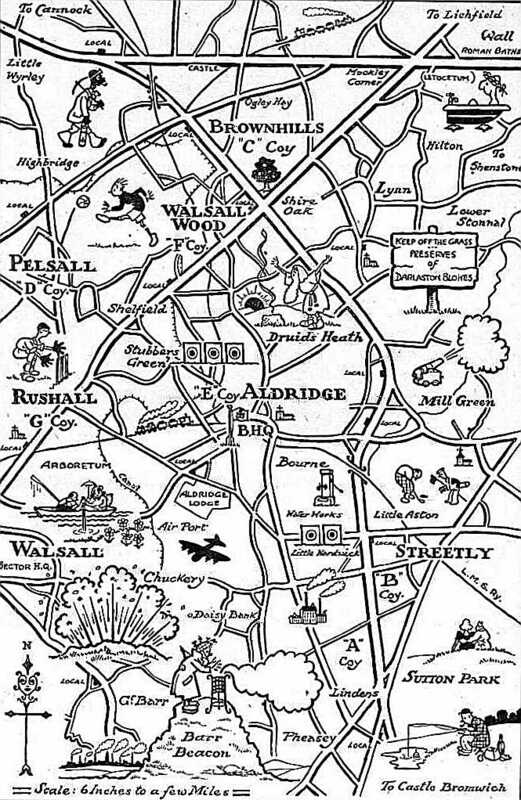 There is mention made of where the local detachment paraded…on the Football Pitch… And one particular parade and march, up the Castles, along Chester Road and back down Lichfield Road to the Football pitch. This may be the time and place of the Guard of Honour photo, if it was taken in Walsall Wood at all. This chap is also unidentified. Any ideas? Comment here, or click on the image to visit their excellent site. However, my dear old lady friend, whose husband, a Bevin Boy conscripted to work as a fireman in the Coppy Pit, was not able to identify any of the soldiers in the photo or its location. Perhaps the sergeant was leading an Aldridge squad in a combined exercise. During the conversation a brief comment was made that the local Walsall Wood squad was only small, that they met in the Boot pub on a weekly basis, and that they went for shooting practice, up the Castles. One mention in Lieutenant Oakley’s article confirms one other local exercise where the Home Guard and the Civil Defence (ARP) were engaged in a joint exercise. One volunteer ‘casualty’, a very corpulent local optician, Bill Southron, was told he would have to carry himself on the stretcher, by two lesser mortals! The exercise was completed and a good breakfast was provided by the Wood’s Home Guard, with more than a little help from a well-known wholesale grocer at the time. No records, as far as I know, were kept of the liquid consumption by patrolling soldiers passing the Irish Harp, or the Shire Oak pub, or the Boot Inn. I expect the local residents kept their heads well down in their Anderson shelters at these times. Walsall Wood’s noble traditions! I hope that this information will be helpful, and that it will bring to light further information in due course, from other interested readers. I recommend readers to take a while and read the fascinating details in the web site mentioned above. The photos at the top of this note are from that site and maybe, just maybe, someone will recognise the soldier with the machine-gun. This map is brilliant, never seen it before. I wonder who drew it? Just love the 'in' jokes, like Caesar in the bath... from the Staffordshire Home Guard site mentioned above. This entry was posted in Brownhills stuff, Clayhanger stuff, Environment, Features, Followups, Fun stuff to see and do, Interesting photos, Local Blogs, Local History, Local media, Reader enquiries, Shared media, Shared memories, Social Media, Walsall community, Walsall Wood stuff and tagged 32Nd (Aldridge) Battalion, Aldridge Home Guard, Arblaster, Brownhills, Brownhills local history, David Evans, local blogs, Local History, Memories of Brownhills Past, Mycock, New Photos, Oakley, Smith, South Staffordshire Home Guard, Staffordshire, Walsall Wood, Walsall Wood football club, Walsall Wood Home Guard. Bookmark the permalink. thanks for the enlarged map on this page..I wonder what the “local” was near St Peters Church in Stonnall. I can work out all the others, but not that one. Also, poor writing by me, the lady who looked at the photo..her husband was one of the Walsall Wood platoon in the Home Guard..not made clear by me. I don’t think the miner is wearing a gas mask. Debating this last night in the pub… we think he’s just blackfaced and smoking a pipe. Love those details, they’re so affectionate. Just adore the couple on Barr Beacon. We think the local in Stonnall is a mistake. Intrigued by the ‘explosion’ in the Chuckery area and the factory marked in Streetly. Guess it must have been Streetly works. I would like to know about the explosion in Chuckery as well. And what’s the meaning of the wicket keeper in Rushall? That would be absolutely brilliant, and I’d love to feature that on the blog. Apart from Davd’s excellent contributions, I’ve had very little about the hHome Guard locally – particularly in Brownhills – which surprises me. Thanks very much, everything appreciated. Gertrude and Doris Shaw; Dorothy Cope; Doris Arblaster; Evelyn Jackson, and will find some super cartoons in the articles , too..
Its starting to snow ! Streetly Manufacturing is the factory..mentioned by David Oakley in his reference to extra Harpers buses. Brownhills Council Office was base for Civil Defence or ARP. I will try to find out about the big gun near Mill Green…Burton’s farmland! Timmins is the artist..his cartoons are in HomeGuard blog.. Would be super to get better info on Knaves Castle in due course! Fingers crossed that readers can add to goodcuppa’s kind offering. re;- Local Home Guard wives, and others, working at Crabtrees, Walsall. Made balaclavas for soldiers during their lunchbreak. Long hours and very difficult to be absent from duty without permission. “Music while you work” on the radio helped the day and work. I hope that other readers will be able to add their info . so going through ‘the box’ came across a Christmas card from K.W.Whitehouse 29 high street, Walsall wood dated 1951, ring any bells for anyone.Also the Balance sheet for Lichfield road (shire oak) for the coronation Celebrations. It tells you who collected the money and C. H. Platt was the Hon. Treasurer. To the task in hand. I know I have Granddads home Guard book, It Must be in the stuff I have filed, to be sorted. will get it. Every time I go into ‘The Box’ I find something new. have got a Certificate to my Granddad for his service in the home guard. he served from 4th July 1940 to 3rd December 1944. signed George R.I. I will collate it all for you in the next few days and scan it all. Also I found, (off topic again), the bill for my great grandma’s funeral. The undertaker was in Walsall wood. Some of this stuff looks like it was sent yesterday. Thanks so much for the contributions, Goodcuppa. Please don’t feel under pressure, I welcome anything you can find, but as and when, take your time. I’m really, really grateful full all reader contributions as they illuminate the past so well. I know that the home guard book is signed by the Police Commissioner, But, yes there is a But. I have just found, while putting stuff back in ‘The Box’ Granddads NATIONAL SERVICE (ARMED FORCES) ACTS, Certificate of Registration. It was stamped —way street Wolverhampton. the first few letter haven’t stamped correctly, so not sure what the name of the street was, Wolverhampton is clear. I was wondering is this why in another envelope, I have a booklet for Small Arms Training, for 1942. Volume I, pamphlet No. 3 Rifle 1942. there were three editions before this 1937, 1941 it says the edition reprinted with ammendments (No1) 1940. so would granddad have been trained to use a rifle. There are44 pages, just thought I would let you know that. Ah that solves another thing I found in ‘The Box’ his calling card, K Whitehouse. My dad was in the Boys brigade. I have a little bit on that. Got loads of other cards from people too. It is all like new. ‘The Box’ is not that big either, just full of stuff. In my room I have my nans radiogram, and I have all the instructions and bill of sale too. I have loads of Bills of sale. Also the utility furniture bill of sale, Didn’t know they had a vacuum in the utilities stuff. If I remember correctly, my nan used that till she died. I really need time to collate them in an order of some sort. old friend confirms a big gun somewhere along the Chester Road..near the Plough and Harrow,possibly. I wonder if any reader from Stonnall History Group can confirm, at all. Also mention again of something on the Shire Oak reservoir. Air Observation Post, possibly…on the top of the convered reservoir, near the Shire Oak pub. Can any reader confirm this, please? thanks to Gordon Mycock, Stonnall History Group for this confirmation; a mobile AA gun was situated” somewhere ” between Lazy Hill and Hobs Hole Lane, during the “blitz”. He remembers the noise it made! This confirms the type, place and time of the gun shown in the Home Guard map, and shows how observant the youngsters of that time really were! Whilst Gordon is doubtlessly correct, I’m a bit surprised that a home guard member would give away the location of such a thing on a map unnecessarily. Something doesn’t feel right there. Is there no possibility of some historical reason for a cannon? I’m not aware of any battles or suchlike at Mill Green, but it would seem to make more sense. Vickers 3.7″ anti-aircraft gun. 7 man crew, shell weighed 28 lbs, firing rate 20 per minute. Used a mechanical analog computer, a Predictor to track aircraft. Mounted on trailer which could be set up in minutes and could be towed at 25 m.p.h. was possibly the WW2 big gun. Apparently still being manufactured in China.!!! I hope some readers can pin-point its location if this was the one in question.! But, you never know . Always expect the unexpected ! I have only just noticed the discussion sparked off by David Evans regarding the local Home Guard, what is recorded about it in my website – staffshomeguard.co.uk – and the images of the unknown machine-gunners. It’s really very gratifying that there has been such interest. I launched the site about 7 years ago and constructed it around the commemorative booklet issued by the local Battalion in 1945. Since then it has stretched geographically and it contains bits of information about HG units throughout the country. To be honest, local interest (ie in the area the Battalion defended, including Aldridge, Brownhills, Pelsall, Stonnall, Streetly, Walsall Wood and others) has been, with just a few honourable exceptions, almost zilch. Could never understand that – there must be many people in the area with fathers, grandfathers, uncles who served. But then, one person’s interest in a subject is another’s big yawn! I’m still very interested to hear of surviving memories of the local HG and seeing any images and documentation (certificates, letters etc.) relevant to its members. Whenever possible I like to give an honourable mention in the website to men (and women) who gave up to four-and-a-half years of their life, usually voluntarily and always unpaid. They and their service should not be forgotten. PS The creator of that jokey map of the area was a gentleman called Frank Timings. (I think I vaguely remember him). The 1945 booklet contains a wonderful selection of his sketches of HG life. They are all in the website. is when Dad had to break into Brookes shop high street because a bomb never went off, he told me he put it in a bucket of water. When the owners got to the shop they thought Dad had broken in and they called the police. The offer to mention father, grandfather and whomever in my Home Guard website is still open! They and their service mustn’t be forgotten. If anyone has information I should be delighted to hear from them. Please email me or leave a feedback message through the website – staffshomeguard.co.uk. That’s very interesting, aereg. You mention the names of Dave Fullelove, Jack Brewer, Fred Bowen, Mr. Udall, Edgar Pritchard, Freddy Heath, Mr. Mason, Mr. Maddocks. I should like to mention them on my staffshomeguard website. Would that be OK? If so, could you check my spelling of the names, please, so that I get them as right as possible. It would be very interesting also to be able to see the photograph. Could you get anyone’s help to show it here, perhaps? Thanks and all the best. Have you checked through the National Newspaper Archives for info on the Staffs Home Guard? May 1941, elderly couple George Thacker and his wife charged with stealing coal…prosecuted on behalf of BCN…..The Company had provided a hut for use of the Home Guard whose duty it was to patrol the area. They were in the habit of providing coal for the members of the Home Guard in the hut. Mrs Thacker: “Do you call yourself a man. If anyone asked you to carry anything for them, what would you do?”……. Don’t forget that French, Polish and Czech airmen are flying with the Royal Air Force. A solitary parachutist may be one of these and unable to speak English. If you see five, or less, they may be our own men. Thanks very much, Pedro. I didn’t realise that there was so much on that site. It will merit a good sorting through and it’s now firmly on my “to do” list! I have also realised that I have not recorded some of the information – especially local names – mentioned in connection with the Home Guard in earlier posts. That is something else I want to do in due course and I hope that neither the contributors nor Bob would have any objection to that. My HG website is regularly archived by the British Library and so anything within it will, in theory at least, be available to future researchers indefinitely. I have the photo and it should be up in the next couple of days. I have read through all or most of the references to the local Home Guard which I can find in this excellent website and have made an attempt to pull them all together. It seems to me that they are well worth assembling and making more generally accessible, in order to commemorate all the men and their service in the defence of their area and to help future HG, local and family historians. Whilst it has been uploaded, it is not really accessible to the world at large except via the link above, and will not be until I integrate it properly into the website. I am regarding it as a draft at present. My first and most important question: are Bob and those members of this website whose information and words I have used comfortable with what I have done? I should be most grateful for any reassurance on this as I have of course no right whatsoever to lift material in this way. Assuming that it IS okay with everyone, I wonder if you would be kind enough to read it through carefully and make sure that there are no major errors or matters for objection in it. I think that I have interpreted everything correctly, but you never know! And, of course, if there is still further information to be added — as I suspect there is — I should be very interested to hear it and to incorporate it into the page. Thanks your forbearance on all this and, especially, thanks for making information available in the first place. Thanks to everyone who has allowed me to use their material. Sorry, was trying to say “Thanks FOR your….” ! !